Chris Badgett and Ali Mathis of the LifterLMS team talk about how you can get your learners taking action with LifterLMS Assignments in this episode of LMScast. Today Ali and Chris dive into what the Assignments add-on can do for your course and how you can integrate it into your learning platform. LifterLMS Assignments is the last add-on that was scheduled to be in the Infinity Bundle, with building a community, coaching, and accessibility as the three main aspects of building a course. The Infinity Bundle covers all three aspects. 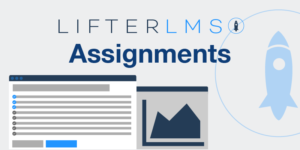 Getting your students taking action towards the results you promise in the marketing of your course is the main goal behind LifterLMS Assignments. Chris and Ali talk about how applying the knowledge your students learn will be key to them achieving results. Long answer essay and upload are the two types of assignments you can give your students. Chris and Ali dive into the details as to what you can do with each type. LifterLMS Assignments is a really powerful tool for opening up a feedback loop between you and your students. The upload assignment type allows you to have your students upload a photo, video, audio file, PowerPoint presentation, Keynote presentation, an Excel document, a Word document, or a PDF. The long essay allows your students to write and submit essays. The essay assignment type allows your students to save their progress, so they don’t have to write it all in one sitting. The LifterLMS Infinity Bundle comes with both the Advanced Quizzes add-on and the Assignments add-on. The main difference between an assignment and quiz is that the quiz is used to test the learners basic understanding, whereas the assignments are used to have the students apply the knowledge on a specific task. Many course builders and membership site owners don’t know how to come up with a price for their products other than just pulling a number out of thin air. Chris and Ali discuss some great strategies you can use and factors you should take into consideration when deciding how much to charge for your products. Head to LifterLMS.com to learn more about the new LifterLMS Assignments add-on and how the Infinity Bundle can improve your online course site. Chris Badgett: Hello, and welcome back to another episode of LMScast. My name is Chris Badgett, and I’m joined by a special guest from the LifterLMS Team, Ali Mathis. How are you doing, Ali? Ali Mathis: I’m great, Chris. Always happy to be here with you. Chris Badgett: Ali is holding the lead as the most repeat visitor. But we want to talk to you today a little bit about the newest member of the LifterLMS family, Assignments. What are we going to talk about, Ali? Ali Mathis: Yeah, first of all, I’m really excited that Assignments is rolled out, because I believe it’s the last product in the Infinity Bundle. Is that correct? Chris Badgett: That is correct. It is the last product that we promised when we initially rolled out the idea of it, nine months ago. Ali Mathis: And how did that process, do you feel, how did that process go in terms of rolling out the products and getting to Assignments? Chris Badgett: I think it went really well. A lot of people were really interested in the idea of what, you know, was in the Infinity Bundle. And what’s really exciting to me is, actually for those of you who are watching this, I know many of you are listening on, you know, podcast or by audio only but there’s like three overlapping circles I have on my whiteboard. One is the online course, one is community and one is coaching. And where these three circles overlap in this Venn diagram, in the sweet spot in the middle, is what is the Infinity Bundle. It’s a stack of not just online courses but also coaching and community which makes for more effective learning environments. More valuable programs, because it’s not just about course content. It’s also about personalization and feedback that comes through coaching with like [inaudible 00:01:52] areas or you know [inaudible 00:01:57] uploaded assignments or you know, essays on quizzes and things like that. So it’s like, it’s more of the stack, it’s not just online courses, it’s also coaching and community if you want to do those things with your learning platform. So I’m really excited to be able to offer a tool that is not just you know, a membership, members only content, there’s all these other modular components that you can add to the stack. Ali Mathis: Yeah. So tell me about the assignments add on and how that fits in with all the other products in the infinity bundle that we just recently rolled out. How does it, where does it fit into the family? Chris Badgett: Assignments. One of my favorite, like, tag lines that I use when I talk about it is, ‘get your learners, taking action.’ And somebody challenged me recently on a webinar. About assignments where, it really needs to be the right action. Which I appreciate. So, one of the things I’m really into and you know this community and this movement, or transformational learning is results. It’s not just about the information age and content and global distribution. Its about integrating that information into action and ultimately getting the results promised in the marketing of the course. So, we have a problem in our industry of what I call just edju-tainment. Where it’s education that’s set-up to be entertaining but doesn’t necessarily get to the results that the students are hoping to get when they buy the course or the program or the offer, whatever it is. Assignments build that bridge of okay, we’ve got good content but lets also get the learner you know, out of consumption mode, and moving into action. So assignments get people moving and integrating that knowledge or applying that knowledge into action. Ali Mathis: So when I hear the word assignments I think of homework. Is that right? Is that basically what assignments are? Chris Badgett: That’s one way to think about it. But it’s a little different in the internet because that different between the test and homework, in a traditional school setting, is really demarcated by the venue or the classroom. Where, you know, tests happen in the classroom, assignments and homework are things you take home, out of the classroom, and bring back later to turn in for a grade. Both tests and homework count against your grade so of varying importance. But on the internet, you know, wherever our computer is, whether it’s in the office, in the home, on the go, on the mobile phone, that venue or that classroom those lines are a little fuzzy. So it’s some of its just semantics but I just like to think of it, you can call it what you want. You can call it a quiz. You can call it a challenge. You can call it an assessment. You can call something an assignment. You can call it homework. You can call it, you know, to-do-list. It just depends on what you’re trying to do as to which one of the Lifter tools you should use and what you want to call it. Ali Mathis: So, well lets talk first about the different types of assignments that are available in LifterLMS. Can you run me through them? There are three of them. Chris Badgett: There’s three currently. Which are the tasks, the upload, and the essay. So the tasks are, it could just be like, it’s basically like a check box and then something to do. For example, and you could have just one task or you could have like a whole string of tasks, almost like, a recipe list, or a to-do list. So, for example, if we were teaching a course on how to build a web-site and the first lesson was about, you know, getting your basics foundation together. And, you know, I have some video content about how the internet works and what are the main pieces that you need to get together before starting to actually build your website. The task list might be: buy a domain name, get web hosting, and install WordPress so you can log into WordPress. There might be like a task list of three items that need to be completed, in order to complete the lesson. And I can also, it like saves so I may, do the easy thing first. Like go buy a domain name. But I can’t complete that assignment because I haven’t done the other two things yet. So if you want to use other tools like prerequisites you’ve kinda locked down forward progress until they do the work. So it would be very easy to kinda start learning how to make a website and then moving onto the next lesson without doing the work but assignments kinda help you lock that down if you want to. And tell the learner exactly what to do, you know. Ali Mathis: That’s called the task site? Chris Badgett: That’s the task type. But it could be, like if I was doing a, you know, a cooking course. And the first lesson was about, you know, making a vegan cheesecake. I might, you know, the first step is to go get the ingredients. The second step is to preheat the oven. The next step is to, you know, make the ingredients. Then bake it. Then cool it. Then serve it, you know. So I can chunk down the content into actual action steps. Ali Mathis: Okay. So what are the other types of assignments? Chris Badgett: So it’s upload and essay. Upload is really, where there’s, I mean there’s a lot of creativity in tasks but there’s also a lot of creativity opportunity in uploads. So you could ask your learner to upload a photo, a video, an audio file, a word document, an excel document, a PowerPoint presentation, a keynote presentation. And I’m just touching on, like five percent of the different type of files people can upload. And you can also, like restrict it. Like let’s say you only want people uploading PDFs you could do that. Or you only want people uploading MP3s, like if you’re doing language learning test. Or assignment. And your having them, you know, recite something in a different language. So that’s what upload is all about. Ali Mathis: Cool. And then the third was the essay. Chris Badgett: Essay. Yeah. I mean. For some people that’s kinda scary because it brings up memories of oh no, when I was a kid I had to write all these essays. Chris Badgett: But it doesn’t have to be. You could be doing, like, a writing course. Maybe it’s like a poetry submission. Maybe it’s journaling. Maybe it’s, you know, just some initial thoughts about something, so that you open up a feedback loop with a student. It’s not even really graded it’s just a way to, you know, make sure you’re student was integrating the knowledge and stuff like that. So whatever you want to call it. Essay I know for some people has a little old school negative connotation but I would encourage people to have an open mind. It’s also cool because you can, lets say you don’t write it all in one go. Its saving as your typing so can always come back later and keep adding to it. You’re not forced to, like stay in the Starbucks and finish it all in one whack. Because sometimes an essay or a writing project is, or a business plan, or whatever it is takes some time. Chris Badgett: So it’s flexible in that way. Ali Mathis: So that’s cool. So kinda like Google Docs? Is that how it works? Ali Mathis: So, one question I’ve seen asked in the community a lot that I wanted you to explain is really like what’s the difference between an assignment and a quiz? And what are some different use cases that you might want to pick a quiz over an assignment or an assignee over a quiz? Or should you have both? I know that’s like six questions in one. Chris Badgett: No that’s a good question. It really comes back to that venue question and like what your trying to do. In my view, when I look at a quiz, I’m mostly looking to reinforce the learning and make sure the student understood what’s going on. Or what the theory I’m teaching. Or how the mental models work that I’m teaching. I’m checking for comprehension. Where as an assignment I can use more for getting them, okay, we have that common ground of understanding something but now lets move into action toward the results that the marketing of course promised you. So to give a couple examples. If we go back to our how to build a website course. I may use, and to be clear, you can have a quiz and an assignment on the same lesson. Chris Badgett: So I maybe talking in lesson one in my [inaudible 00:11:56] about how Al Gore invented the internet. What I am post [inaudible 00:12:02] really is. What a domain is and how it actually works. And what the domain names mean and everything like that. I may have a quiz to you know, make sure people understand some core things that are important to know around web hosting and domain names and email accounts and things like that. That I’m just making sure they understand the foundational principles of the internet before we get into the website building process. But my assignment is going to be way more about taking action. Its gonna be signing up for that hosting account buying that domain name, getting WordPress installed. Where as the quiz might be just testing like making sure we understand what a content management system, or CMS, is which is what WordPress is. So, that’s really the difference between the two and if we were to go you know, to a different industry or niche like health and fitness. If I’m teaching like some kind of health transformation or healing process. I’m going to have some ideas around certain guiding principles of fitness or health that I’m going to be teaching kind of conceptually and theoretically. I may want to quiz the learner on some of those principle to make sure that they got the core concepts. You know whether I’m teaching about toxicity or inflammation or you know, recovery. Or you know cellular damage or things like that. My assignment is going to be all about the solution and moving them into the action with this new information to getting the results. In this case, a health transformation, where I’m getting into issues around the quality of the water, the quality of the nutrition, how we move the body, how we approach recovery and stress. And all these issues. So that’s really the main difference. And I think it can be really exciting. Sometimes these words have, like we talked about the essay, have a negative connotation. But, you know, if the result is like being able to live ten years longer. Or being able to like, you know, be able to play with your kids without getting winded or whatever. These things have major life changing impacts on people. So that’s what’s so exciting about it. Ali Mathis: Yeah. That’s cool. So, from the site owners standpoint. Can you tell me more about how I might be able to structure my course pricing differently if I am offering an add on assignments versus, you know and quizzes. Does that, its kinda a loaded like a loaded question, but does that bring more value to my site at all? Can I? Chris Badgett: That is a great question. So, and that goes back to what we were talking about earlier. Which is, what is the stack? Are we just giving people content with like some ideas or some suggestions or are we moving them towards solutions to results. So we, you can absolutely charge more if your course as an instructional designer, if we have that add on is designed in such a way that dramatically increases the likelihood of the transformation. Or the results promised because we have a plan to get people moving into action with assignments not just give them access to the best information. And the other piece of it is if we are using assignments where the instructor can give feedback or remarks or grades. We are opening up a feedback loop which goes into coaching which is personalization. Because when we realize not all people are the same you know, the way Suzie, and the way Fred respond to my health and fitness material through the assignment or the quizzes. Or how they get stuck and where they have problems maybe completely different. So if I ask for an assignment you know, upload a picture of their pantry and I’m looking at their food. Or open their refrigerator and take a picture. And if I’m a health and nutrition coach I am now able to give personalized feedback based off the pictures of peoples refrigerator contents. So that level of personalization is very valuable and it is, you are able to charge more money for that. Because it’s personalized. It’s coaching stuff. It’s not just good content stuff. It’s like the different between going to the bookstore and buying a book verus going to the bookstore and buying the book and also having the author of the book give you feedback based on you know, your exact situation. So it’s absolutely a lot more valuable when you add that you know, assignments. Both from a getting people moving into action, and the right action. And also, for that personalized feedback perspective. Ali Mathis: Does it have to be either or? Or can people offer both options on their websites and set two different price points. Have you seen that in our community at all? Chris Badgett: Yeah. It’s common where you know, I like to use the framework of so it yourself, done with you and done for you. So the do it yourself path maybe just the content. Where you are not really getting into the instructors time. So I may have like one version of the course that has like the content. And I may use assignments to get people taking action where I’m giving them the task list and stuff. But then I may have like another version of the course or another access model where they get more of that personalization. More of the coaching pieces or other benefits that, you know, can create the very pricing. But if it’s going to take more of my time as an instructor or teacher I’m going to, I have to charge more for that. Otherwise I go upside down on it. Or I run out of capacity. To be able to deliver. So. Ali Mathis: How do you figure out exactly what the right price point is? Like, how do you find the sweet spot? Chris Badgett: If we look at traditional pricing models, the first way that people do that is. Actually, the most popular way is that people just pull a number out of the air. I mean and that’s fine, you can do that. Or they just look around and see what other people are doing and be like, yeah I’m kinda like that, I’ll just do that price. But pricing for course creators and membership site builders is a very interesting topic especially when we get into a more complicated, or not complicated, but complex stack. Like I was talking to someone the other day in a Podcast episode and they were offering like courses plus a website for their particular niche. I was like, ‘oh that’s an interesting stack.’ Or you know if you do courses plus like coaching with like private areas is, and you can like personalize, you know assessments and things like that. And we have some other Podcast episodes about that. It’s way more valuable. But to go back to the pricing question, one way to look at it is from a like the cost perspective the way a home builder builds a home. They often do cost plus. Where the materials or the expenses you know to build the actual house and the labor and everything like that and then there’s like a mark up on top of that. That’s just called cost pricing. So that’s one way to do it. And you just look at the mark up. And a lot of people actually undervalue, or miss, or take for granted the cost of creating something. So whatever it took you to create that course. I mean there’s your. Well first of all a lot of people discount the value of their own time. ifter tools. But what about your web hosting? And you know the computer you used to make the course. And the internet bill and the cell phone bill. All of I mean whatever. It really starts adding up. But that’s the cost approach. The other way to do it is more from a, it’s like a, I forget the traditional accounting name for it. But it’s a it’s where you basically go for as much money as you can possibly get. Chris Badgett: And that is, you know where you are looking for what kind of margins can I get. And that gets into the what’s known as the theory of price elasticity. Which is actually easy to experiment with, with digital products. It’s a lot harder to do with physical products or products that have a large production cycle. So what I mean by that is. You’re basically charging, you’re trying to find, like where, what is the market ready for? You know, what is the most that I can charge for this? And then once you over shoot it, you [inaudible 00:21:57] realize that which is what you need to test it scientifically. So your basically finding out what the market will bare by doing testing and AP testing and that sorta thing. But at the end of the day I don’t necessarily recommend charging as much as you possibly can for something. I think the most important thing is deciding what type of, you know, who do you want to serve? Who do you want five years from now, ten years from now to be helping? What kind of customer do you like to work with? What kind of positive impact do you want to make in the world? And you know these issues, it’s more then just making money. It’s also about service. It’s about legacy. It’s about what makes you come alive as a course creator . And you know what you feel passionate about doing the work. Spending all that time at the computer. And doing all that coaching and community monitoring and content creation and running your business. The passion in all that is important too. But all that is to say, the more you add coaching elements and community elements then you create a stack that’s bigger then just content. The more, you can charge more for that. Ali Mathis: And so, what is coming down the pipe for assignments next? Anything? Ali Mathis: Are there anymore features? Tell me a little more about what’s going on. Chris Badgett: So at LifterLMS our philosophy we don’t focus on the competition. We focus on our customers. And we, the problems were solving, the jobs to be done in the market place. And for us that means learning. The jobs to be done and learning. But assignments it’s really what comes next. We’re in a period now where we’re really listening to our community and seeing what they want. Are there new assignment types that we haven’t thought of yet? That would be helpful. Are there more features that we should be adding to the task list? Is there something that people need form the essay feature that we should add? So basically, we’re listening. Ali Mathis: How are we listening? How are you getting the feedback from people? Like if they, if somebody has, the infinity bundle and their trying out assignments and they are like ‘oh, I just thought of seven great things I’d love for this to do’ what should they do? Chris Badgett: The best way to do that right now, is through the support ticket system while the assignment product is in beta. We are looking to our customers to you know, provide feedback. And that’s the best way to really get into it on what they need and what they want. Ali Mathis: Cool. Anything else we should go over with assignments that we didn’t cover you think people need to hear about or know about? Chris Badgett: I think you really covered it. I just would want to encourage the listener to consider taking this opportunity to get the infinity bundle. To get access to assignments but also private areas, social learning, advanced quizzes and the LifterLMS Mastermind. So if you are interested in assignments or you’re interested in this challenge of like what’s my stack gonna be? Am I going to do coaching and courses? How do I get people taking action? These are the things we talk about a the weekly LifterLMS office hours mastermind call. So I would just encourage you, the lister, to you know, consider getting the infinity bundle to get assignments but also to get access to a group of people doing what you’re trying to do and have great conversations around that. Ali Mathis: Cool. Well thanks Chris. Chris Badgett: Awesome. Well thanks Ali. I appreciate it. Chris Badgett: I hope this episode inspires you to get out there and get your learners taking action.